When I saw that the new Vapor weighed just 6.6 ounces, or not that much more than my (official) Broncos ball cap, I figured that the helmet couldn’t possibly amount to much in the way of coverage and protection. Yet the Vapor offers as much head coverage as any helmet, including those of twice the weight. The secret to the Vapor’s phantom weight and considerable protection is two layers of Kevlar and an internal frame of carbon rods sandwiched in a matrix of expanded polystyrene foam (EPS). 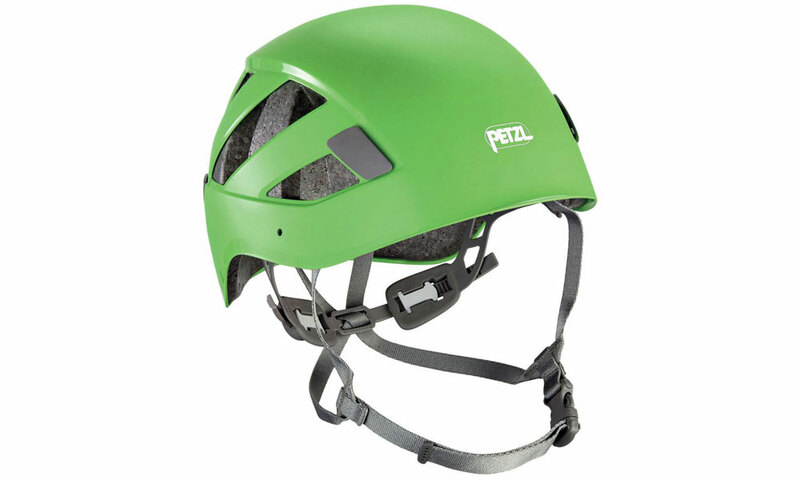 This structure gives the helmet enough crush and penetration resistance to earn it CE certification, and allows BD to use thinner foam than you’ll find in any other helmet. An eggshell-thin sheath of polycarbonate plastic protects the foam. Besides trimming weight, the Vapor’s unique construction lets it sit lower on your head, minimizing the “crystal skull” effect of high-riding helmets that make you look as if you belong behind the controls of a flying saucer. 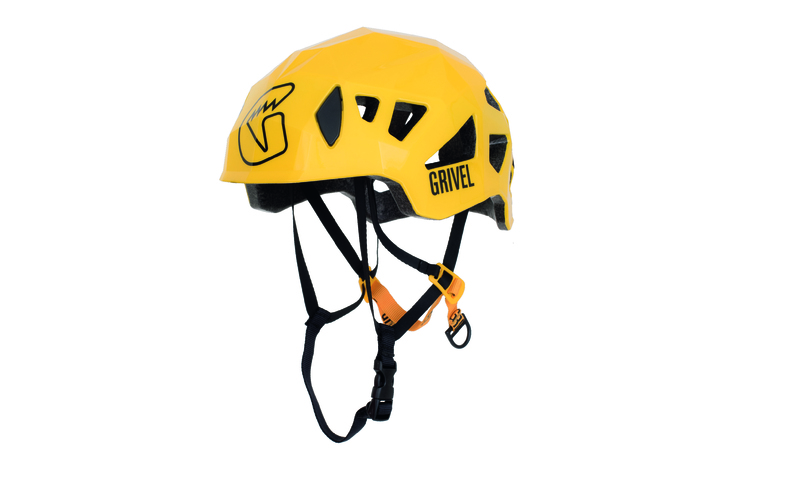 The low-bulk helmet is also less apt to bang against the rock when you are tight to the wall or under a roof. On my head, the Vapor sits about a ½ inch lower than other helmets and to me this is the big selling point. I used the Vapor extensively on rock and ice, and wore a variety of knitted caps under it, plus, of course, my afro. A simple two-way ratcheting head strap let me snug up or let out the helmet’s fit in seconds even when the Vapor was already on my head. The chinstrap buckles and adjusts easily, points that I appreciate after fumbling with other helmets’ gizmos. My concern is durability. At nearly $140, the Vapor is the most expensive helmet made, and the one most likely to get dinged up. Already, mine has a nice dent from when I tossed a pair of crampons on top of it. If you are rough on gear this probably isn’t the helmet for you. Lack of a UIAA certification is also something to think about. While the Vapor passes the CE tests, the UIAA requires that the maximum force transmitted to your head be 2 kN less. In the real world I don’t know if this would make a difference, simply because there’s no body of data about helmet use, accidents and injuries. 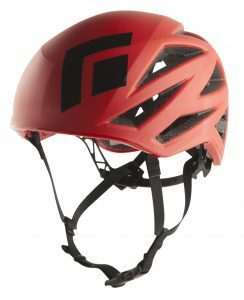 Black Diamond says that they made the Vapor light and low-riding because they wanted a helmet that climbers would wear all the time. To that end they have succeeded. Until now I’ve never worn a helmet for rock climbing. The Vapor has changed my ways. • 6.6 ounces (6.4 w/o accessory headlamp clips)—one of the lightest helmets ever made. • Easy to adjust and buckle. • Foam body with Kevlar and carbon-fiber rod reinforcements. • Lowest-profile helmet on the market. • CE- but not UIAA-certified.